I love food—who doesn’t? And I love to spend as much time in the kitchen as I can, which is probably why my kitchen is the size it is. Lots of counter tops, built- in butcher blocks wherever possible, and professional quality knives and cookware make food preparation a lot easier. However, almost any size kitchen and any array of normal appliances can be used in the preparation of some of my favorite recipes. And no, don’t call me a gourmet. I’m just a dilettante with discriminating taste buds. On the other hand, when I’m deep into a book, I’m liable to throw time consuming recipes to the wind and whip up something quick and easy which can be reheated over several days. Change of Venue: There’s no law that says you’re duty bound to only serve dinner in your dining room—consider the porch, if you have one, or the book room (as I’ve done, above). And do away with such nonsense as “everyday” china. Even if there are only two of you, pull out the stops for yourselves. There’s nothing like a beautifully set table to bring romance into your everyday life! 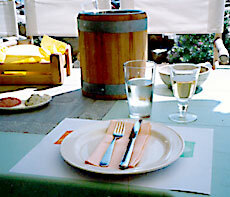 Life’s a Beach: I don’t know what can whet an appetite like informal seaside dining. Here, simplicity is the key ingredient - not to mention what’s being served. Open Sesame: Encrusted with golden brown sesame seeds, there’s no appetizer quite like “grilled” Feta cheese, here served alongside peeled grapes poached in sweet liquor and garnished with fresh greens and a sprig of dill. Foiled Again: Here, a portion of “Grilled Feta Kala Livadi” is topped with Kalamata olives and sprinkled with bits of basil. Sound yummy? Is it ever! My “famous” Carrot Coriander Soup, here festively served in the carved-out shell of a seasonal autumn squash with its own “lid” will always earn you raves! Shared Pleasures: Besides being so simple to prepare, consider a shared vegetable platter consisting of a giant baked potato, Dolmas (stuffed grape leaves, which I shamelessly heat but comes straight out of a jar), and various grilled vegetables. Here it’s a combo of zucchini sliced lengthwise, plus tomatoes, green peppers, and giant mushrooms - accompanied by a dish of plain yoghurt. This Greek recipe is very similar to one found in parts of Turkey, although the Greek version uses feta cheese rather than curd cheese. It’s as simple as pie, and takes no time at all - so long as you remember to cut the red peppers in half, get rid of the seeds, and place them skin-side up in a broiler. When the skins of the peppers turn black (there’s no need to turn them) , take them out of the oven and peel them immediately while hot. That’s the secret to peeling red peppers in a jiffy. I suggest using “Pure” as opposed to “Extra Virgin” olive oil to give the dip more of a “peasant” flavor. Serve chilled (I prefer to chill the mixture overnight in the refrigerator so that it isn’t as liquidy as it first appears). The perfect accompaniments are a very crusty loaf of bread, or slices of French baguettes. You can toast the bread if you like before serving, or simply cut off fresh slices, the way I do. I suggest serving it with a small bowl of Kalamata olives on the side. Oh, and forget vintages - any decent white table wine rounds off this appetizer to perfection. Heat the olive oil in a skillet until hot, stir in the red pepper flakes, and after a minute or so, add the minced garlic (the garlic should be a pale gold; not brown). Remove skillet from heat and let cool. Here’s a classic which Rhea always teases me is a recipe that belongs in “The Old Betty Crocker Cookbook.” Hey - all joking aside, it’s still one of the easiest meals to prepare, and always tastes best when it’s reheated the next day. It’s the perfect entrée for company - since it just needs reheating and gives you time to spend with your guests instead of slaving in the kitchen! Serve with rice, parsley potatoes, or atop egg noodles (I personally tend to favor the latter), and generally pair it with fresh green beans or asparagus. Any good hearty red wine makes an exceptional “marriage” with this dish. Note: I cheat and used canned, drained mushroom slices. The secret’s in the Vermouth! Also, I usually cook two big pot roasts (3 to four pounds each) at a time. This keeps me out of the kitchen for a few days. You will need a very large heavy pot with a lid. Sauté the chopped onion over medium heat and stir until the onions turn translucent. Stir in the garlic for a minute or two (but not until it’s brown). Using a slotted spoon, transfer the onion and garlic to a separate dish. Turn up heat to high (and use your exhaust fan!) and brown the pot roast evenly on all sides in the remaining oil. Turn down the heat back to medium. Stir in the chopped celery and carrots, but don’t let them get brown. Add the garlic and onion mixture, water, beef stock, bay leaves, and the salt and pepper. Bring to a boil, cover, turn down the heat to very low and simmer for an hour or two. Add the vermouth and mushrooms. Cook slowly for another hour or two. You want the meat to virtually fall apart. When the meat is cooked, transfer it to a warm platter and place in a warm oven. After you have a sauce consistency of your liking, stir in the butter to glaze the mixture and add flavor the sauce. You will want to taste it and correct the seasoning with salt and pepper. And there you have it! Take the meat out of the oven and pour the sauce over it. 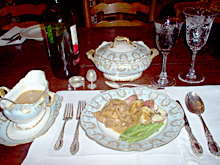 Serve plenty of sauce in a gravy dish on the side. Serves 4-16, depending upon how much beef you’ve used. And the leftovers are just as delicious when they’re heated up. It goes great with rice or egg noodles, and for side dishes I recommend pea, green beans, asparagus, or spinach. A “good” bottle of chilled white wine, such as a Burgundy or Bordeaux add just the right fillip. NOTE: This dish can be prepared in advance and reheated, but the sauce isn’t quite as delicious as it is when it’s served immediately. 4 boneless, skinless chicken breasts, with any excess fat removed. NOTE: The chicken cutlets don’t need to be pounded thin. However, if they are very thick (my choice), you might want to flatten them a bit with the solid (NOT the crisscrossed, scored side of a meat mallet) or else the flat side of a very heavy knife. Also, you will need a very large oven-proof skillet or casserole with a lid, and a piece of wax paper cut to size (you can use the skillet or casserole dish as a template) to cover the chicken once it’s cooking. Preheat oven to 400 degrees. Butter one side of the wax paper with the 1/2 tablespoon butter. Rub the cutlets with the lemon juice on both sides. Salt and pepper lightly. Place the cut-up pieces ( 4 tablespoons) of butter into a very large oven-proof skillet or casserole and place it in the oven. When the butter is foaming, add the cutlets and then turn them almost immediately. Place the buttered wax paper (butter side down) atop them and cover with the lid. I usually let them cook for about 15 to 20 minutes because I like my chicken well done - with no pink in the middle. Gourmets might have truck with that, but that’s the way I prefer it. If you like your chicken slightly pink on the inside, just cook it for a shorter period of time. When the chicken is done, remove it to a heated platter (reserving the chicken juices in the skillet or casserole) and prepare the sauce on the stove top over high heat. Pour in the beef stock and vermouth and boil down until the liquid thickens somewhat. Then stir in the heavy cream and continue to boil down until the sauce has thickened. And voilà! C’est fini! It sounds a lot more complicated than it is - and tastes...well...supreme! Trust me, it inevitably impresses guests. And after you’ve prepared it once, it’ a snap. 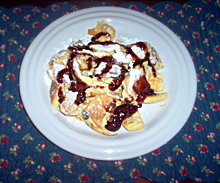 The German name literally translates as “Emperor’s Omlette.” Dating back to the Austro-Hungarian Empire, there are two ways to prepare this sweet, dessert-like dish of raggedly torn crêpes drizzled with red raspberry syrup and dusted with snowy white sifted confectioner’s sugar. The more difficult, hoity-toity way is in the oven. Scratch that. 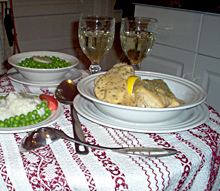 The following method is the way Nick’s grandmother in Austria (where he was born) used to make it, and as a real treat, it was served as a light main course or a light supper. And while the gourmet version uses golden raisins or sultanas, Nick’s grandmother always used regular raisins. NOTE: You might want to use several skillets at once, so that you can cut down on the number of batches you need to cook. Otherwise simply keep each batch warm in a preheated oven (300 degrees, then turn off the oven but keep the door slightly ajar so that the pancakes do not continue cooking..
An excellent accompaniment to “Kaiser Schmarrn” is a sweet white dessert wine. Preheat over to 300 degrees. Once it reaches that temperature, turn it off. Plump the raisins by pouring enough boiling water over them to cover. Let me soak for a few minutes. When they have swelled, remove from water, drain, and dry on paper towels. Separate 6 of the egg whites from the yolks, putting the whites into one large bowl, and the yolks into another large bowl. Crack the 3 remaining eggs, whites included, into the bowl with the yolks. Add the cream of tartar to the bowl containing the egg whites (this will stabilize them when they have been beaten). With an electric beater (mixer), whip the egg whites until they form stiff peaks. Set the beater aside (you needn’t wash it if you do this in sequence). Sift the flour, backing powder, and salt into the bowl containing the egg yolks. Stir to mix, then add the plumped raisins, flour, milk, and vanilla. Beat until mixed. On low speed, gently fold the whipped egg whites into the batter. Dip a crumbled-up paper towel into the oil and thoroughly but lightly grease two skillets. Turn on heat to medium. When the skillets are hot, ladle some of the batter into them, (using enough to make one large pancake in each. Cook the pancakes on each side until they are done and golden, but not brown. Place in the oven to keep warm until you are finished. Tear the pancakes into ragged, somewhat larger than bite-size pieces, place equal portions on individual plates, and drizzle with the raspberry syrup. Then, using a sieve or sugar shaker, liberally dust each plate with confectioner’s sugar. This French classic is exceedingly simple to prepare and makes for a wonderful first course. On the other hand, at times I’ve doubled the ingredients and served it as a marvelous main dish, along with rice and a green vegetable. Be sure and use the small, pearl-like bay scallops rather than the larger sea scallops. Rinse the scallops in cold water and dry well on paper towels. Sprinkle with salt and pepper and then roll them in the flour. Place them in a large sieve and shake off any excess flour. Melt the tablespoon butter in a skillet and add the onions. Cook slowly. Once they are soft and translucent (about 5 minutes), stir in the shallots and garlic. Cook for another minute (being careful not to burn the garlic) and remove the skillet from heat. In another skillet, heat 1 tablespoon plus 2 teaspoons of butter plus the olive oil. Turn heat on high and add the scallops. Shaking the skillet from time to time, cook the scallops for several minutes until they are light brown. Turn heat down to low. Add the contents of the onion skillet, the wine, bay leaf, and thyme to the skillet containing the scallops. Bring to a boil, cover, and let cook for 5 minutes. When done, remove the bay leaf. Butter 4 individual baking scallops or oven-proof gratiné dishes and divide the scallop mixture equally between them. Top with the grated Swiss cheese and dot them with the remaining butter. 5 minutes before serving, place the uncovered dishes in a 375 degree oven until the scallop mixture bubbles and the cheese is entirely melted. Serve immediately. And there you are—a gourmet chef! All three recipes require a raised edge metal baking tin, a piece of aluminum foil, and an 8 oz. “brick” of traditional Feta cheese, preferably Athenos brand. I personally like the sealed Feta in a bit of water or brine to “dry” feta. 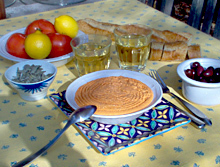 Serve with a bowl of Kalamata olives and cucumber slices. Just before use, dry roast the sesame seeds in a heavy ungreased pan over medium heat. Shake the pan occasionally until the seeds turn golden brown (about 3-5 minutes). Remove from heat and cool slightly. On a plate, spread the sesame seeds out evenly and press all 6 sides of the brick of Feta in them, until the cheese is entirely covered with the dry roasted sesame seeds. Place the cheese on a rectangle of foil and wrap it tightly and neatly, as you would a gift package, but fold the foil several times at the top to make it virtually air tight..
Place in a preheated oven under the broiler for approximately 5-8 minutes, or until the Feta is hot, but so the cheese is not melted; you only want it piping hot. With a spatula, place the foil packet on a serving dish. 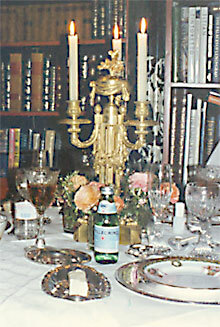 Remove foil at the table, taking care (steam can burn skin!). Cut into 4 equal servings. 1 8-oz. moist “brick” of Feta cheese. Heat the oil in a saucepan. Add the onion and cook about 5 minutes (until it is translucent but not brown). Add the green pepper and tomato. Cook, stirring occasionally, until the green peppers are soft. 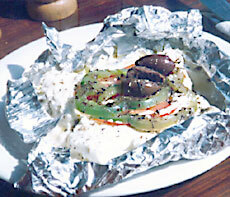 Wipe a little of the excess olive oil on the underside of the Feta and place it on a square of aluminum foil. Using a slotted spoon, scoop up the vegetable mixture and place about 2 to 3 tablespoons of it atop the Feta. Fold the foil around it and cook and serve exactly as the “Paranga Beach Starter.” A nice accompaniment is a plain red table wine which, if you serve it in a carafe, no one will know it’s not Greek! Place the first 4 (dry) ingredients in a blender or food processor and mix for a half minute or so. Add the oil and continue blending until you have a thick cream. Spread a bit of the reserved olive oil on a square of aluminum foil. Place the “brick” of Feta atop it, and spread the top and sides with the pesto sauce. Follow the directions above for closing the foil, using the broiler, and serving at the table. This recipe is from my fellow author and gourmet, Christiane Heggan, whose novel, Scent of a Killer was nominated for the Mary Higgins Clark Award, and whose new thriller, Now You Die is coming out in November. Having grown up in France, it’s only natural that she appreciates good food! So, we decided to exchange recipes for our websites. In a bowl, stir the cream, lemon juice, basil, and sugar. Cover and refrigerate for anywhere from 1 to 6 hours. When you’re ready to serve, divide the cantaloupe cubes and the quartered figs between four salad plates. Drizzle with the chilled cream and garnish with the basil. Now, is that simple, or is that simple? Here’s one of those perfect starter dishes for when autumn is in the air, or it’s winter and you want to enjoy a wonderful meal at home in front of a toasty fire. This cream soup, with its spicy coriander taste is not only relatively simple to prepare, but economical as well. Best yet, it can be cooked completely ahead of time, and even people who are normally fussy about carrots tend to find it undeniably delicious. 3 cups (about 1 & 1/2 one-pound packages) carrots. Peel, wash, and slice the carrots into 1/2-inch pieces. In a medium-size saucepan, melt the butter or margarine and cook the onions for about five minutes over low heat, until they are tender and translucent but not brown. Stir in the shallots and the garlic and cook slowly for one more minute. Be careful not to burn the garlic. Add the carrots, chicken broth, coriander, and pepper to the saucepan. Cover and bring to a boil. Then turn down the heat and simmer for 15 to 20 minutes, until the carrots are very tender. Set the saucepan aside. Once the soup is cool, pour it into a blender or food processor, cover, and puree until smooth. Pour the puree into a clean saucepan, add the salt and sour cream, and stir well to blend. Taste and adjust seasonings if necessary. Heat the soup over low heat, stirring constantly, but do not let it boil, or else the sour cream will curdle. Pour into individual serving dishes and garnish with a sprig of parsley. Then just sit back and accept the compliments. As far as I’m concerned, soups are definitely under-rated. Unless they’re the main event, they’re too often relegated as simply meal starters. Or as something warm during cold weather. For me, this spicy, exotic, and easy to make soup (as well as the Carrot Coriander Soup) head my personal list of favorites. Best of all, they’re both rather unusual, and you won’t be serving the old same-o same-o. Just watch your guests’ (or family’) faces light up when you serve up these unexpected treats. In a medium size saucepan, sauté the onions in the butter and oil until they are translucent (but not brown). Add the chopped mangoes and cook for a few minutes, stirring as needed. Add the chicken stock, salt, pepper, and chili paste. Stir and simmer, covered, for 15 minutes. Remove from heat and let cool. Pour the mixture in a blender or food processor and puree until smooth. (Note: If the mangoes are stringy, sieve the mixture.) Return the mixture to the saucepan and stir in the creamed coconut. Adjust seasoning if necessary. Yield: 4 to 6 servings, depending upon size. Here’s one of the simplest of one-dish recipes; all you need for accompaniment is a very good, crusty loaf of bread for dunking into the sauce. I like to use the Knorr fish bouillon cubes because they save time and labor; I’m generally too busy to spend time cooking my own fish stock. The only labor-intensive part of this recipe is cleaning the “beards” off the mussels. The clams are a breeze to clean if you follow the instructions. Also, you will need a very, very large pot with a cover. Actually, you’re let off easy: since I collect all kinds of sea shells for my grotto (no shell is ever left behind), I save all clam, mussel, and cockle shells (and take them home if I eat out), and really have a job cleaning them after they’re cooked! Oh—before I forget, if you decide to make this recipe into an appetizer, or are in the mood for just shellfish without pasta, this recipe is just as good served in large bowls with plenty of the sauce! Sea salt (or if you can’t find that, use kosher salt. Fill your kitchen sink with a lot of cold water and add a lot of sea salt. (This will cause the clams and mussels to expel any grit.) Let soak for 20 minutes or so. Rinse well and scrub the mussel beards with a stiff-bristled brush. Repeat this step 3 times, always using fresh water and adding lots of the salt. After the final rinsing, you can refrigerate the clams and mussels for several hours. Combine the fish bouillon cubes, the water, and the vermouth. Bring to a boil and simmer for five minutes. Meanwhile, in a separate saucepan, sauté the chopped onion in the olive oil until it is translucent but not brown (about five minutes), stirring often. Add the garlic and sauté for another minute or so, being careful not to let it brown. In a very large pot, mix the fish stock and the onion mixture. Add the parsley, pepper, and red pepper flakes. Stir well, cover, and bring to a boil over medium to high heat. Add the clams and mussels once the broth is boiling. Keep the pot covered but stir every so often, moving the clams and mussels around. The clams and mussels are done when they are open (this usually takes 8 to 10 minutes or so. Stir once more and remove from heat. Serve in the shells over cooked linguine (you will need deep dishes), being generous with both the shellfish and the broth. Sprinkle generously with grated Parmesan cheese and provide plenty of bread for dunking—and try not to smack your lips too loudly! Yield: 6 to 8 servings, depending upon appetites. There is nothing more delicious than a properly made Risotto. Unfortunately, most restaurants either do not have it on their menus, or don’t do it properly. The reason? It’s time and labor intensive—but what’s 20 to 30 minutes? A lot, I suppose, if one person has to be kept stirring the risotto until it is completed. But trust me, this one is fabu...and will earn you raves. Trim away the worst part of the dirty mushroom stems. Then separate the remainder of the stems from the caps and soak the caps and stems in a large pot of cold water for 10 minutes. Under cold running tap water, scrub the stems and tops of the caps with a stiff brush (I find the best brushes aren’t the ones sold in gourmet stores, but the cheap kind sold as fingernail brushes at the local drugstore). Chop the clean stems and caps into 1/2-inch pieces. Put the olive oil and one tablespoon of the butter (reserving the rest for later) into a large, heavy bottomed pot and place over medium heat. Add the onions, stirring every now and then. They should become translucent but not brown. Then add the parsley and the chopped Portabella mushrooms. Cook, stirring occasionally, until all the liquid from the mushrooms has evaporated. In a separate saucepan mix the beef broth, water and salt and pepper. Bring to a boil, then let simmer. When the risotto is done, add the remaining 2 tablespoons of butter and the Parmesan cheese. Stir to mix thoroughly, adjust seasonings if necessary, and serve at once. This is one of those impressive, flawless entreés many people wouldn’t dream of making at home because...well, because it just looks and tastes complicated. Nothing could be further from the truth. And to be really fancy, all you need is a 5 to 5 &1/2 cup semi-circular fish mold, although you can bake it in any mold or appropriate oven-proof dish you may have. Wild rice, asparagus and green beans are the perfect complimentary side dish. Add béarnaise sauce (recipe follows) , and—ta da!—you have the equivalent of love and marriage. Don’t worry about leftovers, either—this dish is as good served as a chilled paté and spread on toast as it is served hot, straight out of the oven. The lesson of that anecdote? Use fresh ingredients whenever possible—and if you’re cooking for real gourmets, never use a shortcut. When you are ready to bake the salmon, throw out the marinade mixture and wipe the excess off the fish with a paper towel. Lightly butter a Pyrex baking dish and place the fish in it, skin side down, and bake at 350 degrees until the fish is done (and flakes with a fork). Do not overcook. Let the fish cool, then scrape the pink the pink meat off it and crumble it into small pieces. Discard the skin. In a saucepan, heat the milk until it boils. In another saucepan over medium heat, melt the butter or margarine. Add the 2 tablespoons flour and stir swiftly. If you are using real butter, cook for several minutes while stirring, but don’t let it get brown; if you are using margarine, don’t let it cook any further. With a wire whisk, beat the boiling milk into the butter, a little at a time. The resulting bechamel sauce should be thick and smooth, but don’t worry if there are small lumps. (The blender will take care of them.) Let the sauce cool. In a blender or food processor (you’ll need to do this in two batches), add the fish, lemon juice, eggs, egg yolks, sand, and pepper. Blend at high speed for a minute until the mixture is smooth and pink. Add the cooled white sauce, heavy cream, and vermouth. Blend for another 20 seconds. Strain the sauce through a fine sieve into a large bowl. About 45 minutes before you intend to serve this dish, generously butter your mold and fill it with the smooth light pinkish-brown mixture. Place in a pre-heated, 350 degree oven inside a larger dish in which you’ve added 4 or 5 cups of boiling water (this is very important for your mold to turn out perfectly). Bake until firm—it’s about ready when it begins to shrink from the sides of the mold. But to be on the safe side, test it with a needle; like a cake, it’s done when the needle comes out clean. Carefully remove from the oven, run a knife around the edge of the mold, then place a serving platter atop the mold and turn it upside down. And voilà! Everyone will swear you’re a first rate chef! Serve with the béarnaise sauce. Basically, Béarnaise sauce is Hollandaise Sauce to which some tarragon has been added. And here you can either follow the recipe below, or cheat a little by using a store-bought mix. If you do cheat, only buy Knorr brand Béarnaise (or Hollandaise if they’re out of Béarnaise; Hollandaise goes perfectly well with this dish). However, if you want to try your skills in the kitchen, here’s how to make a perfectly acceptable but quick Béarnaise from scratch (there are more complicated ways to make it, but who wants to spend all their time in the kitchen?). Place the egg yolks, salt, pepper, tarragon, and 1 tablespoon of the lemon juice in a blender (save the second tablespoon of lemon juice in case you’ll need it). Heat the butter in a small saucepan until it foams. Blend the egg yolk mixture for 2 or 3 seconds at high speed. Then, keeping the blender uncovered (you may wish to have a towel ready to protect yourself from splatters), continue blending at high speed as you dribble a very thin stream of the hot butter into the mixture. You should have a thick mixture by the time you’ve used up 2/3 of the butter. (Don’t add the whitish residue at the bottom of the butter pan). Taste and adjust the seasonings accordingly. If you don’t use the sauce immediately, pour this portion into a bowl and set it in tepid—but not warm—water. Likewise, if you want more sauce, repeat the above step a second time (but don’t just double the ingredients the first time around, as you’re bound to run into trouble). Okay, let’s face it: Chicken Pot Pie is undeniably an American dish. However, this version is so fragrant that even the crust reminds me of Provence. And yes, it’s quite labor intensive...but when you get your first whiff of it...and your first taste...you’ll have a good idea of what Provence smells like, even if you’ve never been there. In a large mixing bowl combine the flour, baking powder, salt, 1 & 1/2 teaspoons thyme (reserving 1/2 teaspoon for later), 1 & 1/2 teaspoons parsley (reserving 1/2 teaspoon for later), and 1 teaspoon of the lemon rind (again, reserving the rest for later). Add the butter and yogurt and mix until it resembles coarse meal. Add the milk and stir until loose and sticky. Cover and refrigerate. Heat the tablespoon of olive oil (reserving the rest for later) in a large skillet, lightly sauté the chicken breasts, then remove with a slotted spoon. Discard the oil. Heat the remaining teaspoon of olive oil in a large, cast-iron (or Calphalon-style) oven-proof skillet. Cook the onions, stirring occasionally, over medium heat until translucent but not brown (about 5 minutes). Stir in the garlic and watch carefully that it does not brown or burn (about 1 or 2 minutes). Add the vermouth, cover, and simmer for 5 minutes. Add the broth, any remaining herbs, and the rest of the grated lemon rind. Stir in the chicken, carrots, mushrooms and parsnips. Cover and simmer for 30 minutes. In a large cup, mix the cornstarch with the cold water. Stir 1/4 cup of the broth into this mixture, and then quickly stir the contents of the cup into the skillet. Stir well so that the broth is smooth and not lumpy. Simmer for two more minutes, then remove from heat and set aside until skillet is cool. On a floured surface, roll out the refrigerated dough with a dough roller until it fits the diameter of the skillet top. Cover the skillet with the dough, pinching the sides well. With the tines of a fork, poke some holes in the dough. Bake until the dough is lightly browned, about 15 minutes. Who doesn’t like mashed potatoes, unless of course you’re on a low-carbohydrate diet like Atkins? Every once in a while even yours truly cuts out potatoes and other starchy foods, but when company comes, I go all out. (Besides, it’s rude to assume just because you’re on a low-carb diet, everybody else is too.) But when you decide to sin—well, jump in and splurge—but make it worthwhile, like with this fabulous (and fabulously easy) dish. Place the potatoes in a medium-size saucepan and cover with an inch of water. 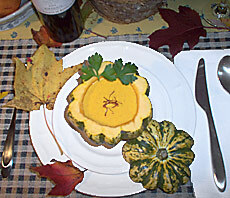 Place the squash cubes in another saucepan and cover with an inch of water. Bring both the potatoes and the squash to a boil, lower the heat, and simmer until they are soft (about 15 minutes for the potatoes and 10 minutes for the squash). Test with a fork for softness. Warm the heavy cream and the salt in a small saucepan. Stir in the salt and serve piping hot. Bon Appétit! Yield—8 servings, depending upon appetites. I’ve found that for certain recipes, the best potatoes are also among the cheapest. For this recipe, use those you buy in 5-pound bags. No need to get fancy-schmanzy. Also, once these are in the oven, you only need to turn them once or twice. This leaves you with around half an hour during which to complete whichever entrée the potatoes are to accompany. Peel, wash, dry, and slice the potatoes thinly and evenly. Make certain they are dry. Reserving 1 tablespoon of the butter or margarine, melt the rest in a saucepan. Put the garlic through a garlic press and, stirring constantly, sauté it in the butter or margarine until it turns pale gold but not brown. Use the remaining tablespoon of butter or margarine to grease a large baking tin (the kind with raised edges). Spread the potatoes out on the tin in overlapping rows and brush them with the melted butter and garlic mixture. Sprinkle evenly with the salt. Bake the potatoes in a preheated 450-degree oven for about 30 minutes (or until golden brown). You will want to turn them once or twice. This portion serves 4, but they’re so delicious you might want to double the ingredients! Here’s the perfect and most delectable (talk about divine!) accompaniment to roast turkey or roast chicken. And do take my advice: roast turkey isn’t just for Thanksgiving or Christmas. In the Gould household it’s a regular specialty, thanks to the leftovers (which I personally call “pre cooking”). I mean, who has the time to spend hours a day in the kitchen? Not yours truly. Besides, the number of dishes you can make from cooked turkey—everything from Club Sandwiches to Turkey à la King means you’ve cooked for days in advance. I’m also a great believer in freezing cooked turkey (and cooked gravy). I mean, why not prepare your own “TV Dinners” ahead of time? I do. Anyway, to the best sweet potatoes ever! And mean ever! With a stiff, bristly brush, scrub the sweet potatoes. Cover with water in a pot and bring to a boil. Cook until barely tender (15 to 20 minutes), but do not overcook. Drain and rinse under very cold water and set aside. (The cold water will keep them from cooking any further). Grease a shallow baking dish with 1 tablespoon of the butter. 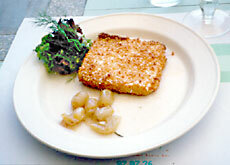 Place the potato slices in a rectangular dish, overlapping them. Drizzle evenly with the remainder of the butter. Sprinkle evenly with salt and pepper and the light brown sugar. About 3/4 of an hour before you are ready to eat, bake the potatoes in a preheated 425-degree oven for 20 minutes. Then lower the temperature to 350 degrees for another twenty minutes. By now, the potatoes should have a nice glaze. Right before serving, warm the bourbon over low heat in a small saucepan. Wearing oven mitts, and standing back from the pan, ignite the bourbon. Pour it, still flaming, over the potatoes. Here’s a heavenly dessert mousse which is easy to make and presents a beautiful, successful climax to any meal. Flavored with orange liqueur, it’s guaranteed to sing on the taste buds long after the dinner is over. Measure 1/4 cup cold water in a heavy saucepan. Sprinkle the gelatin over it and let it soften for 10 minutes. Set a large metal bowl into an even larger bowl of ice and cold water. Continue on to the next step. Whisk the egg yolks slightly, then add them to the softened gelatin. Then add them, the orange rind, orange juice, orange liqueur and 1 cup of the sugar (reserving the remaining 1/2 cup until later). Stirring constantly, cook the mixture over medium heat until it thickens slightly and coats the spoon, but do not let it come to a boil. Off heat, beat the mixture with a whisk to stop it from cooking further. Transfer the mixture to the cold metal bowl (the one set in ice) and, stirring for several minutes, let it cool until it is lukewarm. Whisk in the yogurt. Discard the large bowl with the ice. Cover the bowl with the mixture in the refrigerator and chill it for half and hour, until it is cold and slightly thickened, but not set. In another large, deep metal (or glass) bowl, beat the egg whites, salt, cream of tartar, and remaining 1/2 cup of sugar until they hold stiff peaks. With a rubber spatula, fold a quarter of the egg whites into the refrigerated mixture. Then gently fold in the remaining whites. Spoon the completed mousse into 1-cup capacity stemmed dessert glasses or bowls and chill, covered loosely, for at least 2 hours, but for no longer than 24. This fabulous dessert serves 6 to 8 persons. Yours truly believes this is one of the near ultimates in desserts. Just make sure you have an electric lemon/lime juicer to make your work easier. In a heavy saucepan sprinkle the gelatin over 1/4 cold water and let it soften for 10 minutes. Stir in the grated lemon and lime rinds, the lemon and lime juice, the egg yolks and 1 & 1/4 cup sugar (reserving 1/4 cup for later). Cook the mixture over moderately low heat, stirring constantly, until it has thickened slightly. Transfer to a large metal bowl which is set in an even larger bowl of cold water and ice cubes. Stir occasionally. After the mixture has cooled to lukewarm, whisk in the yogurt. Cover and chill the mixture for 30 minutes (or until it is cold and slightly thickened, but not set). In another bowl, beat the egg whites, the salt, and the cream of tartar until they form stiff peaks. Stir one fourth of the mixture of egg whites into the lemon-lime mixture, and gently fold in the remaining whites. Spoon the completed mousse into dessert dishes (preferably stemmed clear glass ones), and chill, covered loosely with plastic wrap, for anywhere from 2 to 24 hours. English Trifle dates back at least to Elizabethan times (1598). Strangely enough, trifle fell out of favor during Tudor times. And then, suddenly in 1763, it popped up again. There must be dozens of varieties in which this dessert can be made, but all of them consist of five basic ingredients: sponge cake, sherry-soaked (plus perhaps brandy-soaked) macaroons, custard, fruits and jams, and syllabub or whipped cream. For simplicity’s sake, I use whipped cream. Keep in mind that this is one dessert which you can experiment with using various liquors, fruit, and jams, and is a testimonial to the British taste for “nursery food”—no matter your age. Liberally butter and flour the cake pan. Melt the 4 tablespoons butter and set aside to cool. Using a separate bowl and an electric beater, gradually mix the sugar into the egg yolks, add the vanilla, and beat for several minutes until the mixture is a thick, pale yellow. In yet another separate bowl, beat the egg whites and salt until it forms soft peaks. Sprinkle with the 2 tablespoons of sugar and beat until the peaks are stiff. Transfer 1/4 of the egg whites into the bowl with the melted butter and egg yolks. Add 1/4 of the cake flour and blend the mixture with a rubber spatula. Repeat this slowly 3 more times, until the egg whites and flour are depleted. Add half the cooled but melted butter. Blend, then add the rest of the melted butter (but throw out any milky residue on the pan’s bottom). Do not overmix; you want the egg whites to retain as much volume as possible. Transfer the batter to a 10-inch square cake pan. Tilt the pan so that the batter has a chance to cover it to the rim all around. Place in a preheated, 350-degree oven for 30 to 35 minutes. The cake is done when it is light brown, puffed, and shrinks from the sides of the pan. Remove from the oven and place on a cooling rack for about 10 minutes. (It will shrink some more and sink slightly.) Then run a knife around the edges of the pan, give it a gentle shake, and reverse it onto a plate. Let it stand for at least an hour or so; you want it cool before continuing to the next step. Heat the milk until it boils. Meanwhile, place the egg yolks in a large bowl and gradually beat in the sugar with an electric beater for a couple of minutes. When you have a pale yellow mixture, beat in the flour. Then, using a wire whisk, slowly add the boiling milk in a thin stream, whisking all the while. When you are done, pour the mixture into a medium size (preferably heavy enamel) saucepan. Place the saucepan over medium heat and, whisking all the while, bring the sauce to a boil. Turn down the heat and simmer for several minutes, still whisking and making sure the bottom of the saucepan doesn’t get scorched. Remove from heat and whisk in the vanilla extract and the brandy. Let it cool, but place a dot of butter atop it so a skin doesn’t form. You can also cover the cooled custard with waxed paper, and refrigerate it for a day until you’re ready to use it. You shall need a very large bowl (preferably a glass-sided trifle bowl). Cut the spongecake into small thin slices, and spread with the jams. Line the bottom of the trifle dish and the sides with these little spongecake “sandwiches,” alternating them with ladyfingers if you like. Sprinkle with a couple of fingers of lemon zest. Drizzle with the sweet sherry, and add some of the optional toasted almonds. Spoon a third of the custard on the bottom and sides of the “sandwiches.” Add some of the banana slices and strawberry halves, and half the optional kiwi fruit. Sprinkle with some more of the lemon zest and optional almonds. Add a little more of the custard. Then layer with the macaroons or amaretto biscuits in a pleasing pattern. Drench with your choice of brandy, cognac, or amaretto liquor. Cover completely with the rest of the custard. Sprinkle with more lemon zest. Top completely with the whipped cream and garnish with the reserved fruit. Chill well in advance of serving, preferably overnight. Giving it a shake every now and then, heat the almonds in a heavy saucepan atop the stove. You want them slightly toasted but not burned. A golden color is what is hoped for. Remove from heat. Simplement, as they say in France, non? And there you have it: the greatest pudding of all time. And remember, you can play with this recipe by using peaches and syrup or the like instead of the suggested fruits. And yes, this is a verrrry rich dessert...but isn’t that what desserts are for? Serves a whole bunch, hopefully with leftovers.